Order today to receive FREE BONUS GIFTS! 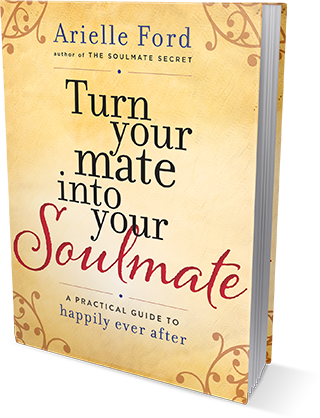 Sneak Peek: Read the introduction and chapter one of Turn Your Mate into Your Soulmate before it hits the stores! The Everything Book: The Essential Details About the One You Love – Take your love and relationship to a whole new level. Imagine going so deep, you and your partner know each other at a soul level. A life of true understanding, caring, and keeping each other happy and satisfied. You can with this step-by-step guide. Author of the international bestseller The Soulmate Secret, Arielle Ford offers the keys to re-discovering love, passion, respect, and renewed commitment years after the simple act of falling in love and getting married. She unlocks the wisdom learned in her own marriage along with expertise gleaned from friends and experts such as Harville Hendrix, John Gray, Dr. Helen Fisher, Neale Donald Walsch, and Marianne Williamson to help readers find a happy middle ground between the rare, precious, and unattainable romantic notion of love, and the reality that happens when restlessness, anger, or disappointment set in and act as a stubborn barrier to happiness and fulfillment. Why we yearn to be connected to another person. Breathing new life into old love by kick-starting the fun. Read by Karen White. Click here to view on SoundCloud. The power of Arielle Ford’s new book is that she shows you how to realize that you already are the love you seek—and to use that knowledge with yourself and those whose lives you touch. I can’t think of a greater gift than that.